If you haven't already done so, please head over to the ProWalker download page to download the latest version of the software. It is not adivsed to have both Podium Walker and Pro Walker GPU installed in the same SketchUp version. The two can not be invoked at the same time, and have nearly identical icons. We recommend uninstalling Podium Walker before installing and using ProWalker GPU. 1. Windows Installation for SketchUp 2016, 2017, 2018 and 2019. The ProWalker Windows installer is an .rbz installation file, which must be installed directly from the SketchUp Extensions manager. You may download the .rbz file to any folder on your computer, but please do not try to install ProWalker from outside SketchUp. Note: Internet Explorer 8 may automatically unpack .rbz files so we recommend you use IE 9 or higher, FireFox or Chrome to download .rbz files. 1. 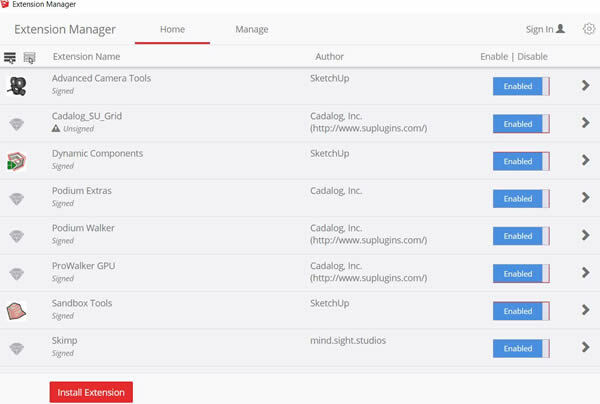 Launch the SketchUp Extensions Manager: (Window Extension Manager). In earlier versions of SketchUp this was found at (Window Preferences). About RBZ files - SketchUp .rbz files are installation files that install extensions (plug-ins) from within SketchUp 8, 2013, 2014, 2015, and 2016. You must install the Windows version of Podium Walker from within SketchUp’s Window menu, Preferences/ Extension dialog box. Do not attempt to install the Podium Walker .rbz file from outside of SketchUp. Remember, the ProWalker .rbz file will only work with Windows versions of SketchUp. 4. Restart SketchUp - ProWalker will appear as ProWalker GPU in your extensions menu upon re-opening SketchUp. 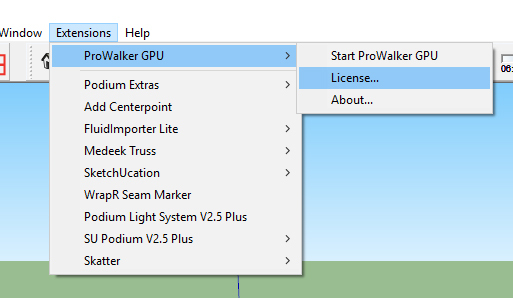 All users: Activate your Podium Walker license from the ProWalker GPU menu in the SketchUp Extensions menu. In the license manager, enter the sixteen alpha numeric license code that you received via email. Note: Your ProWalker GPU license cannot be used on more than one computer simultaneously.